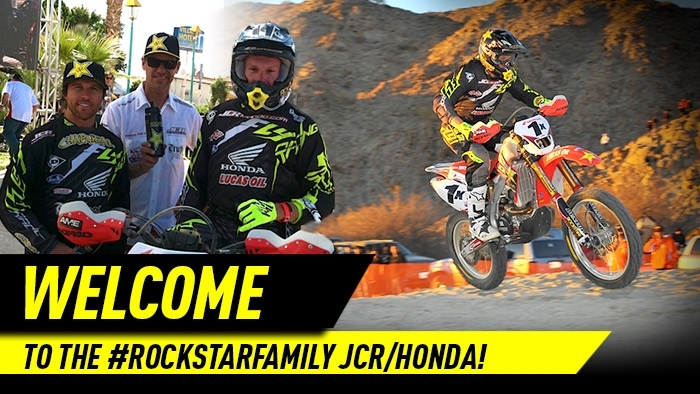 Rockstar is excited to announce the addition of Johnny Campbell and the JCR/Honda Racing Team to the 2013 athlete roster. Honda's desert racing legend, Johnny Campbell - the 11-time Baja 1000 winner with a boatload of SCORE and BITD (Best in the Desert) titles - has formed his own racing team, aptly named Johnny Campbell Racing (JCR). Johnny has taken his years of racing knowledge and experience to recruit the most talented Off-Road racers in the business and set about the task of winning championships. The JCR/Honda Racing Team includes off-road riders, Timmy Weigand and Colton Udall, who just won the SCORE Baja 250 and will be competing in the entire 2013 SCORE Baja Series. Endurocross rider, Colton Haaker, will also join forces with JCR/Honda this season as the team takes on the Endurocross Series and the X Games Endurocross International throughout the year. With such impressive talent there is no doubt that more titles are on the horizon for JCR/Honda in 2013!